Funeral March for the Obsequies of a Deaf Man (1884), a composition by Alphonse Allais. It consists of nine blank measures and predates comparable works by John Cage ("4′33″") by a considerable margin. The Incoherents (Les Arts Incohérents) was a short-lived French art movement founded in 1882 by Parisian writer and publisher Jules Lévy, which anticipated many of the art techniques and satirical attitudes commonly attributed to later avant-garde art movements as novel. The "art movement" included the film animator Émile Cohl and spawned seminal works such as Negroes Fighting in a Tunnel at Night (1882), Mona Lisa Smoking a Pipe (1883) and Funeral March for the Obsequies of a Deaf Man (1884). Lévy coined the phrase "les arts incohérents" as a play on the common expression "les arts décoratifs". The Incoherents presented work which was deliberately irrational, absurdist and iconoclastic, "found" art objects, the drawings of children, and drawings "made by people who don't know how to draw." On their first exhibition in the home of Lévy on October 1, 1882, Lévy exhibited an all-black painting by poet Paul Bilhaud called Negroes Fighting in a Cellar at Night. The early film animator Émile Cohl contributed photographs which would later be called surreal. 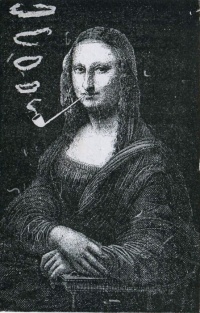 In the 1882 show, the artist Sapeck (Eugène Bataille) contributed Mona Lisa Smoking a Pipe, an 'augmented' Mona Lisa that directly prefigures the famous Marcel Duchamp image L.H.O.O.Q. of 1919. Although small and short-lived, the Incoherents were certainly well-known. The movement sprang from the same Montmartre cabaret culture that spawned the Hydropathes and Alfred Jarry's Ubu Roi. The 1882 show was attended by two thousand people, including Manet, Renoir, Camille Pissarro, and Richard Wagner. Beginning in 1883 there were annual shows, or masked balls, or both. The movement wound down in the mid 1890s. The Incoherents were even less politically-minded than the Hydropathes. Their slogan was "Gaity is properly French, so let's be French". The focus was absurdism, nightmares, and the drawing style of children. Émile Cohl's Incoherent art joined his caricatures and satiric news reporting at La Nouvelle Lune, where he had become the major contributor and acting editor. He became editor in chief on November 30, 1883. By November 1883, the Incoherents had become so big that an exhibit was arranged at the Galerie Vivienne, open to the public. It was called "an exhibition of drawings by people who do not know how to draw." Émile Cohl's contribution was titled Portrait garanti ressemblant (Portrait--Resemblance Guaranteed). The exhibit accepted any and all entries, so long as they were not obscene or serious. The public was taken with the show, and the profits were donated to public assistance. There was a second show in 1884, and the 1885 show was replaced by a masked ball (Cohl went as an artichoke). In 1886, Cohl produced his most bizarre and characteristic work in the Incoherent vein: Abus des metaphors, a collection of more than a dozen colorful expressions brought to life. The Incoherent arts were born in the late nineteenth century, a period that was rich in scientific discoveries and social innovations. Cheeky and inventive, this time also marks a turning point in the field of art. The official art traditions were even being questioned in the newspapers through satirical images which implied it was a dying craft. It was in this creative lull that Jules Levy - former member of the literary club Hydropathes - decided to organize "an exhibition of drawings made by people who can not draw." This charitable carnival helped victims of a recent gas explosion to have an opportunity to present their works. The first "Incoherent arts" get-together, which took place on July 13, 1882 on the Champs Elysées hosts many curiosities. Taking advantage of a power outage, and lit only by candlelight, they created a jumble of rebellious works, using all types of materials and any inspiration with the ultimate goal of making people laugh. On October 2, 1882, Jules Levy decided to repeat the experience at home. He gathered his friends under the pretense of having an "unusual evening". In his tiny apartment they worked under the phrase "Death to clichés, to us young people!" They received unexpected success and lots of newspaper coverage. As a result, the Incohérents arts movement became engrained into the Parisian cultural landscape. In October 1883 the Paris had its first official exhibition of Incoherent art, ran by local Galerie Vivienne. The purpose was charitable as with all Incoherent exhibits thereafter. A regulation 13-point proclamation was that "All the works are allowed, the serious works and obscene excepted". The exhibition adopts a true catalog, including a piece by Lévy d'Orville in which he reverses an inkwell for the sake of aesthetics. The tone of the exhibition was set by an abundance of parodies and pictorial puns. More than 20,000 visitors took part over a month. A year later, the Incoherents returned to haunt the Galerie Vivienne with their cheeky pranks. They hoped this occasion would see the image of the "Chief pipes Poyle sand without number, on a silver field," an ancient statue carving chisel of an academician who does not lead wide. A catalog accompanied the exhibition with luxury engraved reproductions of most of the significant works. On its cover, a dancer brandishes a broom and scares away the gloom of black birds. The journalists accompanied the event with enthusiasm. The artists were increasingly familiarizing themselves with the pictorial map and the pun, both of which helped to establish this kind of "Incoherent" art. In 1886 the Incoherents at the Eden Theatre unveiled their new exhibit. Jules Chéret's poster included Levy going through the moon like a paper hoop. At the entrance, the rules regarding the event were framed prominently: "One goal you propose, laugh and cheer you frankly." The room was also full of visitors that worked in high, medium or low relief. Everything was recorded in catalog records which are decorated with "striking" portraits of exhibitors and zany references. In 1886 Jules Levy began to be the target of criticism. He was accused of using the Incoherent Arts for its own interests. He had in fact opened a publishing house in 1886 and published the works of his friends (Goudeau, Leroy, Monselet, etc..), illustrated by artists such as Boutet, Somm or Gray. He gradually lost the support of the Le Courrier français who had declared him as "the official unofficial Incoherent" in 1884. Meanwhile, some seeking to take advantage of the Incoherent movement by opening Incoherent cafes or established magazine operations, that the founders of the movement had nothing to do with. In 1887 Jules Levy promised the end of Inconsistency would be on April 16 of that year. A costume party was organized for the occasion with a Folies Bergere funeral procession. However, Incoherence has a brief renaissance on March 27, 1889 at a new dance held at the Eden Theatre. Levy wanted this event to remind the good memories of the Incoherent arts and to announce the return of his exhibitions. But in the spring of the 1889 exhibition he organized, while the Expo was in full swing in Paris, it was a fiasco. The press hardly covered the event, and even the Le Courrier français remained silent. The Incoherent arts was no longer a novelty interest. Jules Levy, refusing to give up, created the magazine Folies Bergere in January 1891. Poorly organized, not repeated, the show is considered too long and the ball too short. The last gasp of the inconsistency, his exhibition of 1893 had a brand new premise at Olympia, and passed almost unnoticed. Jules Blois of the French Mail wrote: "All that is outdated, outmoded. Inconsistency joined decadence, decay and other jokes with or without handles in the bag of old fashioned chiffes" Despite that, Levy still pulled on the Incoherent string until 1896 when it was met with massive indifference from the press. The Spirit of Montmartre: Cabarets, Humor and the Avant-Garde, 1875-1905 (1996) by Phillip Dennis Cate et al. Unless indicated otherwise, the text in this article is either based on Wikipedia article "Incoherents" or another language Wikipedia page thereof used under the terms of the GNU Free Documentation License; or on original research by Jahsonic and friends. See Art and Popular Culture's copyright notice. This page was last modified 13:35, 17 June 2014.